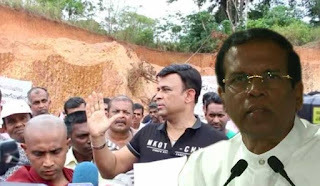 While claiming that the Geological Surveys and Mines Bureau (GSMB) should be held responsible at the controversial earth removing in Gampaha, President Maithripala Sirisena said today that the engineer and the other officials who authorised the particular licence should be interdicted, pending an inquiry. Attending an opening of the ‘Haritha Sihina’ educational and environmental exhibition held in Kurunegala, the President said that 60,000 cubes of earth had been removed from the particular place and transported to fill the Muthurajawela marshland. “No one has noticed where the soil was being transported. Six months earlier State intelligence reported me that some villagers blaming me,” he said. He said that officials had not supervised if the permit holder was operating according the permit. He said that it was GSMB officials under his purview had made the first mistake.“Over 20- years soil mining was done at the same place with the support of the State institution,” he said.